How is it possible? How could someone who claims to care about cult movies—and dares to sound off on them every week—not have seen Harold And Maude? How can I speak with any authority on, say, the films of Wes Anderson or countless other American independents with such an embarrassing, unforgivable gap in my cinema education? And how can I have seen and admired every other major Hal Ashby film from the '70s—The Last Detail, Shampoo, Bound For Glory, Coming Home, and Being There—and yet somehow missed the most enduring, most quoted, most fervently embraced effort of his career? Reason #1: Let's say you get a letter from your grandmother, and for whatever reason, you don't have the time to write her back promptly. You feel guilty about it, because you love your grandmother and her infectious, Ruth Gordon-esque lust for life. As the days and weeks and months go by, that guilt occasionally gnaws at you, and deepens your shame about being a bad grandson. And yet your embarrassment actually prevents you from finally putting pen to paper, because how do you account for having gone so long without writing the damned letter? When you're so used to not doing something, even if you know it might enrich your life substantially, doesn't it become harder to do over time? "And so what we get, finally, is a movie of attitudes. Harold is death, Maude life, and they manage to make the two seem so similar that life's hardly worth the extra bother. The visual style makes everyone look fresh from the Wax Museum, and all the movie lacks is a lot of day-old gardenias and lilies and roses in the lobby, filling the place with a cloying sweet smell." These excuses aside, I realize that I have no legitimate excuse and that I've allowed Harold And Maude to fall into some Bermuda Triangle in the recesses of my critical mind. And now that this blasted "Better Late Than Never" feature has finally smoked me out of the cave of willful ignorance, my shame is now more profound than ever. Because while I suspected that the film was influential—and I had seen it referenced constantly over the years—I now know that Harold And Maude represents the birth of modern indie quirk, and a healthy percentage of the films I review every year owe it a serious debt. To someone who writes about movies for a living, this is horrifying news, akin to having spoken the English language for a lifetime without knowing the word "as" was available for use. 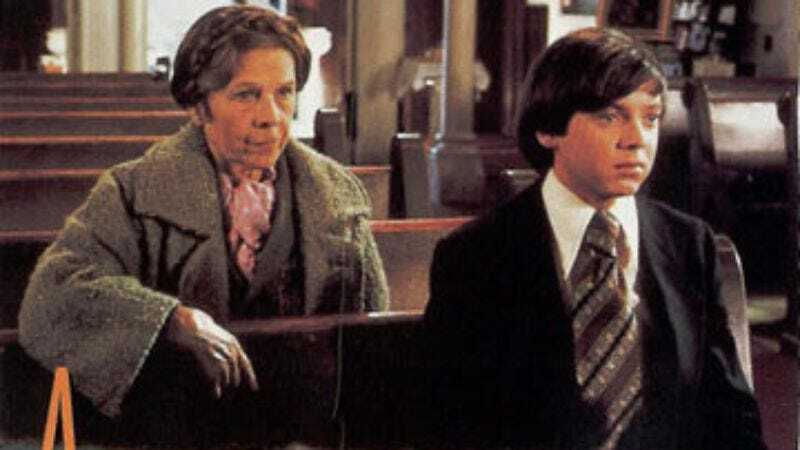 So if you'd like, please retroactively insert a Harold And Maude reference into about half of the independent or pseudo-independent films I've written about for the past 10 years. So how does Harold And Maude look today, seen with fresh eyes? Mostly terrific, but also more than a little familiar. As I said, the film is the birth of modern indie quirk, full of elements and attitudes that have become cliché: Heroes who are more whimsical conceits than real-life, flesh-and-blood creations; an offbeat and slightly twee pop soundtrack (here by Cat Stevens); authority figures painted as stiff, clueless, and completely devoid of humanity; and some vague leftist political references thrown in for good measure. It may sound like I'm being snarky and dismissive here—and I'll be the first to admit that familiarity has bred some contempt—but there's good quirk and bad quirk, and Harold And Maude still falls on the right side of the line. For me, the litmus test for quirkfests is whether there's some genuine insight and depth of feeling behind all that willful eccentricity. (For example, I would say "yea" to Wes Anderson films and Juno, but "nay" to Little Miss Sunshine and Garden State. But one's mileage for preciousness definitely varies.) There are many great things about Harold And Maude, but you have to start with Bud Cort and Ruth Gordon, who are playing characters who could easily be reduced to tidy symbols (with Harold as death and Maude as life, as Ebert puts it), yet they're completely endearing as a screen couple, and they somehow transcend the contrivances that bring them together. The yin and yang of their ages and temperaments is deliberately extreme—he's a morose, death-obsessed 19-year-old; she's a high-spirited, vivacious 79-year-old—but as a pair, they're touching and complete, and Cort's Harold, in particular, seems startled and grateful that he's being brought out of his shell. "I think much of the world's sorrow is from people who think they're this, but allow themselves to be treated as that," says Maude, in a rare but crucial bit of philosophizing. Her sunflower metaphor sounds obvious and precious, to be sure, but it's also simple and immensely moving once the sunflower field transforms into a graveyard, reminding viewers of Vietnam and the individuals who have died needlessly. Given what's happening in Iraq, that shot hit me like a sledgehammer, and I'm guessing that audiences were similarly flattened by it at the time. But more than just political metaphor, the scene really works to transform Harold's glum, adolescent ideas about the world. He seems to believe that one day, his mother will have her way and he'll become just like everyone else, conforming mindlessly to what's expected of him. As a 79-year-old who hasn't lost her rebellious streak, Maude is a testament to the potential longevity of eccentricity, which is good news for Harold. But equally good news is the fact that he can learn from her example and embrace life on his own terms; Harold obsesses about death because he doesn't see another way out of his suffocating life. Maude opens the door. In the end, Harold And Maude metes out these life lessons directly and without much ambiguity, yet that does little to diminish its power. That's the thing about quirkfests of the sort Harold And Maude inspired: They have a childlike innocence at their core that's very delicate, and if handled poorly, it easily veers into preciousness. I'm not entirely thrilled that this film inspired so many bad ones, but Halloween sparked a decade of dopey slasher movies, and that's still considered a great film, too. And yes, I've seen Halloween.